If you're searching for a wood burning stove that's made in the USA, a Buck wood stove is a great choice. Based out of Spruce Pine North Carolina, it all began in 1975 at a small country store when the two men began selling a wood stove that appealed to many homeowners during the oil and gas crisis. 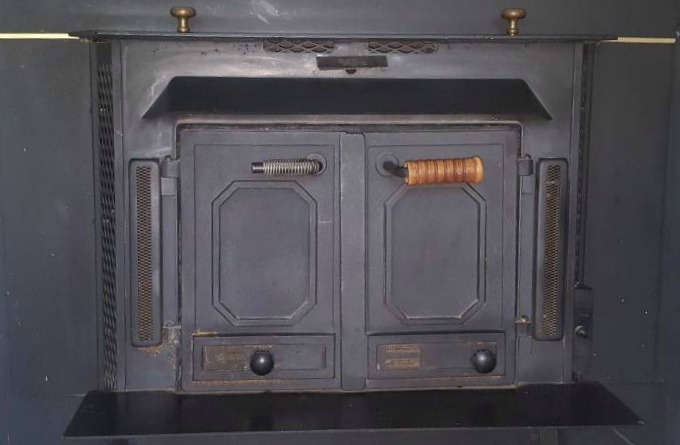 When sales went from 30 stoves a week to 3,000 stoves per month in less than a year, it was apparent their first wood stove called the "Regular Buck" was an instant success. Then as the company continued to expand, two new stoves called the "Big Buck" and the "Little Buck" were added to the production line. Now, over 40 years later, what started as a small store has now turned into a 300,000 square foot manufacturing facility that stretches over 80 acres. Buck has over 15 models of wood stoves available and also produces gas fireplaces, outdoor grills, fire pits and even outdoor patio furniture. To learn more, let's take a closer look at some of the most popular Buck wood stove models to see which one is the best choice for your home heating needs. If you're looking for an older Buck stove, chances are you'll find either a model 26000, model 27000 or model 28000. Since the older models feature a double door, the easiest way to tell the difference between the stoves is by measuring the opening of the firebox. If the opening measures 18 inches, it's a model 26000. If the firebox opening measures 20 inches, it's a model 27000. If the firebox opening is 24 inches, it's a model 28000. You basically have two installation options when installing one of these older Buck wood stove models. You can install it as a fireplace insert, or as a free standing stove. Throughout the years a lot has changed in the safety and performance of wood stoves and their installation. What was once a common installation practice back in the 1970's and 1980's has changed a lot. For more specific information about the stoves components and installation read this link that gives specifics about installing an older model Buck stove. The newer Buck stoves are broken into two categories.....catalytic and non-catalytic stoves. The choice between a catalytic stove vs a non-catalytic stove mainly depends on your personal preference. I personally like non-catalytic stoves because I don't want to deal with replacing a catalytic converter years down the line....but there are positives and negatives to each model. Plus, I think a non-catalytic stove is easier to operate when compared to a catalytic stove. Below you'll find a brief overview of the stoves in each category to help you determine which stove is best for your home heating needs. Model 80 Catalytic Wood Stove - The Model 80 is a versatile stove that can work for a variety of different homes. It has a larger 2.6 cubic foot firebox which can handle logs up to 22 inches in length and can heat between 1,500 - 2,600 square feet. Capable of producing 40,500 BTUs per hour, this is a great stove. Model 91 Catalytic Wood Stove - The Model 91 is Bucks number one selling catalytic wood stove. Capable of heating up to 3,200 square feet, it can be installed as either a fireplace insert or as a freestanding stove. Its large 4.4 cubic foot firebox can handle logs up to 21 inches in length making this a great choice for larger homes who want an overnight burn. Model 21 Wood Stove - Made for smaller sized homes, the Model 21 can heat between 800 - 1,800 square feet and features a 1.6 cubic foot firebox. It can handle firewood up to 11 inches in length (when measured front to back) and can produce up to 41,200 BTUs per hour. If you have a smaller home or if you're looking to heat just a specific part of a larger home, the Model 21 is a good choice. Model 74 Wood Stove - The Model 74 is similar in appearance to the Model 21 but it's capable of heating a larger area. Its 2.6 cubic volume firebox can heat up to 2,600 square feet and produce up to 40,900 BTUs per hour. Since it can handle logs up to 22 inches in length, you'll spend less time cutting firewood and more time enjoying your warm cozy home. 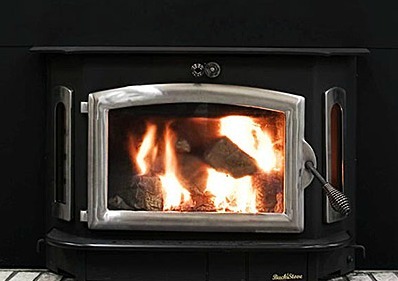 Model 85 Wood Stove - The Model 85 can heat up to 2,700 square feet while producing 45,000 BTUs per hour. Since the Model 85 can be installed as either a fireplace insert or a free standing wood stove, you have a variety of installation options to fit your homes specific needs. Whether you're looking to install an older Buck stove from the 1970's or 1980's, or you're in the market for one of Bucks newer and more efficient models, Buck produces a great wood stove. This USA produced stove has a lot of happy customers who continually enjoy the beauty and performance of a Buck stove.